Traditionally, patients with atrial fibrillation (Afib) who are at increased risk of stroke have been limited in their treatment options. Most are prescribed blood thinners to prevent clots, but that comes with significant lifestyle restrictions – the smallest of cuts could bleed for a long time, and a more significant injury could lead to potentially life-threatening bleeding. In patients with nonvalvular AFib, more than 90 percent of blood clots form in the left atrial appendage (LAA), a small, sac-like structure with a funnel-shaped opening. The WATCHMAN is an implant, roughly the size of a quarter, which is permanently placed in the patient’s LAA. 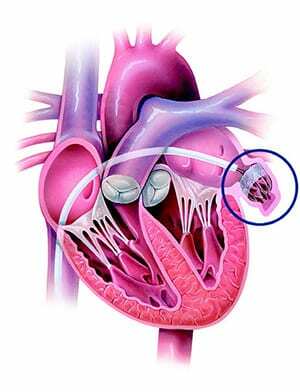 The device plugs that opening, trapping any clots that form and blocking them from leaving the LAA and causing a stroke. In select patients qualifying for the WATCHMAN implant, it offers the possibility of reducing the risk of stroke while eliminating the need to take blood thinning medication. Implantation does not require open-heart surgery. Instead, a cardiac team inserts the device through a tiny needle puncture in the patient’s upper leg. Using a catheter-based system, the cardiologist guides the device through the femoral vein into the LAA. Careful imaging with transesophageal echocardiography is crucial for the team to expertly place and secure the device. The procedure is performed under general anesthesia and typically takes about an hour. Patients are usually able to leave the hospital the following day. Once home, patients take a blood thinner medication for a minimum of 45 days to prevent clots from forming until the body’s own tissue seals the area, securely covering the device. Most patients then take a combination of aspirin plus clopidogrel for six months, and then transition to aspirin-only therapy. WATCHMAN is the latest addition to the comprehensive list of procedures offered by St. Peter’s Hospital, which has received multiple recognitions and awards for its compassionate, high-quality, and patient-centered cardiac care. To learn more about WATCHMAN or the other cardiac and vascular services at St. Peter’s Hospital visit http://www.sphp.com/cardiac-vascular-sph or call Albany Associates in Cardiology at 518-458-2000.